As a parent your to-do list can seem endless. Go to work. Drop the kids off at school. Take the baby to daycare. Pick up the kids. Cook dinner. Take the kids to soccer practice. And, the list goes on and on. As a busy parent it can be hard to focus on frugality when you can barely keep your head on straight. In these instances it’s the small things that can have the most impact on your financial situation. 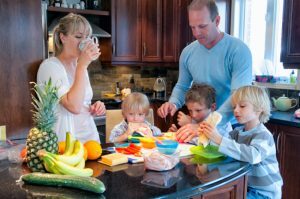 Here are three ways busy parents can be more frugal. Keeping your meal planning simple is not only a cost effective strategy but it can free up a ton of time for you. Stock your pantry and freezer with some go-to, simple, and healthy meals that the whole family will enjoy. What I often do is prepare several meals in advance that I can throw in the crockpot for those busy days. To do this simply gather all of your ingredients, put them in a freezer bag, and toss in the freezer. In the morning simply empty the bag into the crockpot. You’ll have a delicious meal waiting for you when dinner time comes around. Clean up is also extra easy, which is an added bonus! I tend to do much of my shopping online since it’s a huge time saver. And, every time I do I make sure to check and see if there is a coupon code to go with my purchase. Frugaa makes this process even simpler. You simply visit Frugaa select your budget and the category or store you want to shop at and Frugaa will show all the available coupon codes that fit your chosen criteria. You won’t have to spend time weeding through different sites or searching for codes that coincide with your budget. This is another easy way to save time and money. As parents it can sometimes be hard to resist buying the latest toys or signing up children for every after school activity – but really, most of this is unnecessary. You shouldn’t feel obligated to buy everything you see for your child. Free activities, like spending time outdoors, can be the most fun and memorable things you can do together. Have a “fancy” dinner in which you and your children dress up, use your good dishes, and eat at the table. Visit parks and watch your children play. Have your kids put on a play for you. There are endless free activities you and your children can enjoy, you just have to be willing to use your imagination. It can be hard to stretch your frugal muscles when you’re always strapped for time. However, if you take a couple minutes at the start of the day to plan things out you can save time and money. Start by making a few small changes. Once you get the hang of it you’ll be able to easily identify opportunities that will benefit your bottom line.